From my body at 12 weeks. And there on the screen was my child. I sprang off the table toward the image. It was coming from me. Searching online for studies on hypothyroidism. While completing my double Master’s degrees there. The Endocrine Society’s 2007 guidelines for pregnancy. And less than 3.0 in the second and third. I repeat less than 2.5. Of hypothyroidism, in conventional medicine that is. Wait let me get the lab report taken during my pregnancy. Lab score was the word HIGH. At close to 10.0 during my pregnancy. On the mother’s thyroid hormone supply. Was unable to properly grow and develop. All because my doctor didn’t read the guidelines? That this was a much more complex problem. Or the American Academy of Family Physicians. Only 11.5% had read the Endocrine Society’s guidelines. I knew something was wrong during my pregnancy. My instincts roared at me. That doctors, they are human, just like us. Not even something as important as this. And even bossy and demanding if needed. Good girls are never bossy. Well, being a good girl got me in this mess. I’m asked all the time. I failed to protect my child. And now I am in the best health ever. Because of my severe hypothyroidism. I should have better protected you. MY VOW. MY BOOK. Your Healthy Pregnancy with Thyroid Disease. 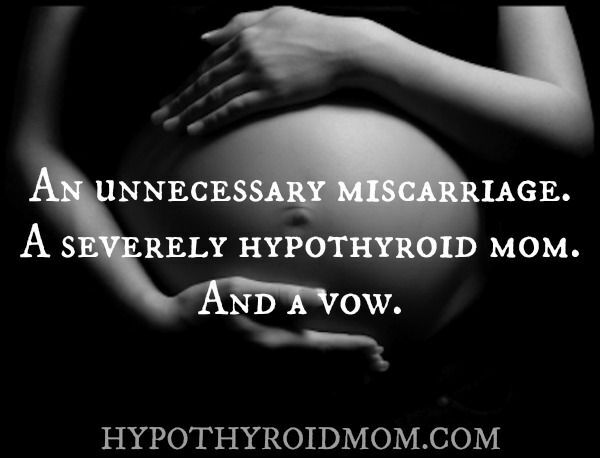 I had 5 miscarriages 3 between 8 n 10 weeks and 2 at 16 weeks both requiring surgery 15 yrs later trying to uncover another mystery illness during a time I was waiting for a parathyroid to be removed I was then told it was likely it was my thyroid that was causing the miscarriages?!?! I was finally blessed with a beautiful baby girl 15 yrs ago. I had 4 miscarriages. The longest I was able to carry was 14 weeks in 2008. Was the last one. I had already been diagnosed with hypothyroidism when we were in California but noone explained it, and I obviously didn’t do enough research. I had a partial hysterectomy 2010 and that same year was sent to an endocrinologist that told me I cld still have children if I took a baby aspirin daily. I replied back that I would also need a uterus. Luckily back in 93 I was able to conceive and carry my handsome son. Before… I am grateful for him. Thank you for your story and this page. I also lost 3 children to Thyroid disease. I was 17 years old the first time. Doctors never mentioned my Thyroid. Being so young I didn’t know about what thyroid was all about. I did have my first born at 20 born full term and healthy. And at 28 a second child. I have hypothyroidism and now am 71 years old still dealing with symptoms every day. You literally wrote this the day after I had a miscarriage at 9 weeks you will never know the way that you have just touched my soul… I feel pain I feel guilt I feel resentment I feel anger and you put it all into perspective. I too only have one child oddly enough A 6 year old boy…. and Jan 27th 2019 I lost my baby who stopped developing at 7 weeks though I was 9 weeks pregnant… I thank you for your story… You just never know what someone is going through.